Located in northern Italy just forty kilometres from Milan, the hilltop town of Bergamo has a wealth of historic buildings and sights to explore. Surrounded by a protective wall, this beautiful town offers an interesting mix of stunning architecture, museums, galleries and restaurants. You’re sure to find there is plenty to see on a weekend break or on a daytrip from Milan. 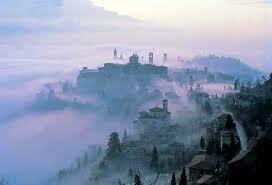 If you’re after low cost flights to Bergamo, Italy these are available with Ryannair. These direct flights are operated from a number of UK airports. Boasting an extremely pretty location, Bergamo sits on the edge of the Alps with the historical part of the town, or the upper town, being full of amazing medieval and Renaissance architectural sights. You won’t want to miss the Palazzo della Ragione with its portico dating back to the 12th century or the church of Santa Maria Maggiore which houses a spectacular and ornate 1705 wooden confessional, said to look like sculptured chocolate. One of Bergamo’s most popular attractions and an art lovers dream is the town’s 200 year old art gallery, the Accademia Carrara, containing works by the great masters Botticelli and Bellini. Raphael’s San Sebastiano is a particular highlight. You can take a funicular ride to the small hilltop settlement of San Vigilio and admire the spectacular views to the mountains and lower town below. As well as the town’s many historic attractions there are plenty of places to enjoy a coffee and a relaxing pizza or just wander around the cobbled streets soaking up the atmosphere. For great offers on cheap flights and lastminute flights to Bergamo, Italy check out our superb flights search facility at Directflights.com. The cheapest flights are likely to be found out of season, avoiding the peak holiday periods. 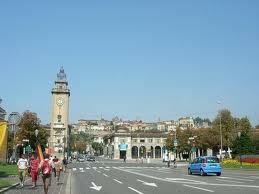 Bergamo offers four seasons with moderate temperatures, similar to weather in the Northern United States. January offers an average high of 41 degrees F and a low of 28 degrees F. July tops out with an average high of 81 degrees F and a low of 62 degrees F. Humidity is highest in the winter and lowest in the summer. Average humidity ranges from 67 to 79 percent, with the highest humidity during January. Spring and fall offer more mild temperatures and humidity. Plenty of sunny, clear days grace Bergamo’s skies with nice breezes blowing from the lakes around the city. The average rainfall through the year ranges from a little over 2 to 5.1 inches. Rain is more likely from May to August. March has the least average amount of rainfall. Otherwise, winter is cold, summer is hot, and spring and fall are somewhere in between.